In the hectic world of today, a weekend seems to be the only time for people to wind down and take care of their spiritual state. For such a purpose, many individuals visit a church, as this place can keep them closer to God and enrich their lives with love, peace, encouragement and joy. However, it is definitely not enough to strengthen the spirit once a week, that’s why a lot of churches get online platforms to teach the Word of God to the local community on a daily basis. Owners of small or new religious organizations may find it problematic to allot financial resources for building online presence. In cases like that, the Free HTML5 Theme presented here will come in handy. Using this TemplateMonster product, you will have an opportunity to introduce your church to the audience thoroughly. Browsing through your site, its visitors will learn about your mission, location, events, pastors and many other details that will give them a clear idea of what to anticipate from your organization. 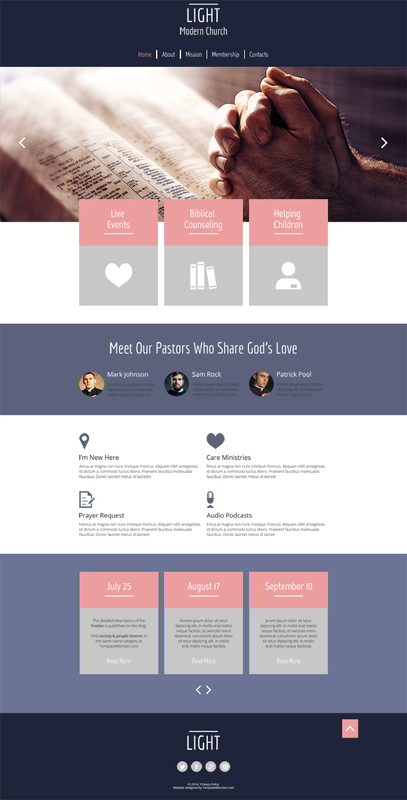 One of the main aspects that every religious-related site should have is an uncluttered design, and it can be observed in this template. Due to such a peculiarity, nothing will distract people’s attention, and they will quickly find all the necessary information. With purple dominating in the theme’s palette, you will be able to set the soothing atmosphere on your platform, which will assure individuals that they will find relief at your church. Furthermore, this background color divides content blocks so that visitors of your site could easily orient themselves there. Download this religious theme with a thought-out layout for free, and your church will reach a lot of people interested in studying sacred writings. This entry was posted in Clean Website Templates, Free Website Templates. Bookmark the permalink.